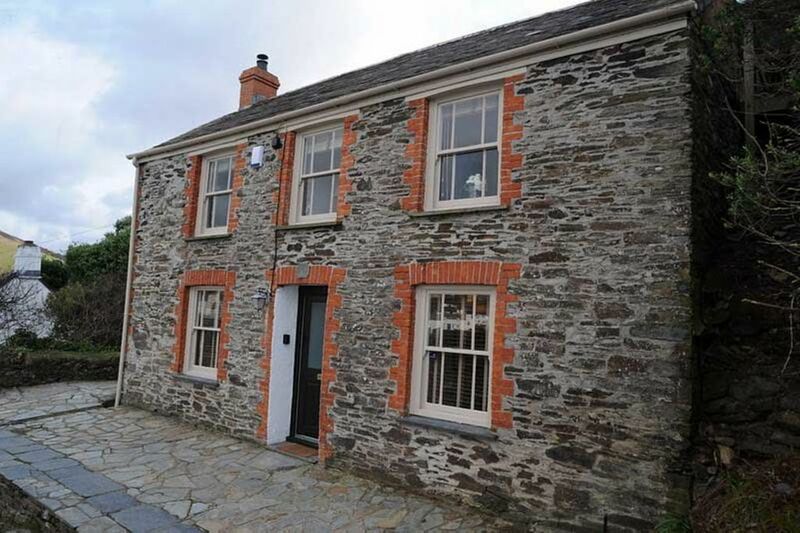 Detached 2 Bedroom Cottage Above Port Isaac Harbour As Featured In Doc Martin. This stunning cottage is the surgery in the famous Doc Martin tv series with breathtaking views over the historic harbour of Port Isaac . Ground Floor: entrance hall, cloakroom /wc, sitting room with stone fireplace , beamed ceiling and slate flagged floor, separate dining room with log burner , and a modern fitted galley kitchen. First floor: attractive landing with wonderful harbour and sea views, two spacious double bedrooms - each with fabulous harbour and sea views and fitted wardrobes, large modern bathroom. Outside: car parking, slate sun terrace and raised lawned garden on two levels to the rear of the property, with magnificent sea views. No parties or groups over 4 in number. Family bathroom with bath , basin , toilet and separate shower . There is a washing machine/dryer in the cupboard off the bathroom. There is a separate downstairs cloakroom with toilet and hand basin . Under floor heating in dining room and upstairs bathroom . Towels are provided for all guests during their stay at the cottage.. Comfortable beamed sitting room with sofa and chairs , Sky tv and multi region DVD and wooden floor . Panoramic views over the harbour. Apple docking station with remote control and radio etc . Gallery kitchen with all usual appliances, cooker, fridge-freezer, microwave, dishwasher etc. Notes on accommodation: Check with owner if pets allowed. Please note in the low season there is the minimum charge but in the high season the minimum stay is 5 nights. The changeover day is generally Saturday. It may be possible to vary this in low season. Long weekend break available [ minimum 3 nights ] Rentals commence at 4pm and we ask that the property is vacated by 10am . LATE BOOKINGS AVAILABLE Outside: In the garden there are garden chairs and table with elevated views over Port Isaac harbour. Utility Room: Washer/dryer is in a cupboard off the bathroom. Ironing board Cleaning / Towels / Linen / Maid service: Linen and towels for guests use in the cottage are included. They are changed weekly for stays over 7 nights . Other: Separate dining room with table, chairs, sideboard, and views over the sea and harbour from the front of the cottage . We had a great time here. Since you give up privacy staying in this cottage whilst filming is going on, it is also a fun place to stay when they are filming at the cottage itself. We met Martin and Caroline and got to see Martin work with Buddy. Shirley was responsive to our needs. The only suggestion I have is to have a small trash bin in each bedroom which would make it easier for makeup etc. Great pre-arrival communication, easy-to-follow directions. Beautifully appointed cottage, spotlessly clean, stunning views. This would be a delight without the connection to Doc Martin, the connection makes it a perfect break. Strongly recommend! We recently stayed at Fern Cottage and really enjoyed. The place is perfect whether you are a mad Doc Martin fan, like my partner or not! The cottage is beautiful, has everything you could need and has fantastic views to enjoy as well. It is in the perfect location to discover Port Isaac, Padstow and the surrounding area. Will certainly go back again. The perfect property and location for our short (too short) stay. We love Port Isaac and the surrounding area and having had a weekend break last year, we couldn't wait to go back. This year we chose Fern Cottage, having admired it last year and being big fans of the TV series Doc Martin. The property exceeded our expectations and met our requirements perfectly, as a base for exploring Port Isaac and the north and south coasts of Cornwall. It was clean, spacious and very comfortable with all the facilities required and of course offers amazing views of the harbour, town and surrounding countryside. Shirley is very helpful and very responsive to any questions and emailed us prior to our stay with all the information needed and useful suggestions and advice to help our stay run smoothly. Very comfortable and furnished really nice. One of England's Most Beautiful Places!!! A few minutes walk to the picturesque village of Port Isaac, the harbour and beach. A short distance to restaurants including the Nathan Outlaw's Fish Kitchen , The Mote ,Edge Restaurant and the Slipway Hotel. for more information about the house and its use in the TV programme. Booking Notes: Bookings are generally for 7 nights however short stays and late bookings are available . To book we ask for a 25% deposit and the balance settled 6 weeks before arrival. Payments can be by bank transfer or debit / credit card [except American Express /Diners Club] There is a security deposit of £250 which will be returned after guests have departed and the cottage has been checked. No pets allowed. Changeover Day: Saturday is our preferred changeover day but at certain times it can be flexible. Guests should ensure they vacate the property by 10 am . The cottage is available to guests from 4 pm onwards. Notes on prices: A security deposit of £250 is payable and will be returned after guests departure and the cottage has been checked. No pets allowed.